We live in a more enlightened age when it comes to what we eat, both its impact on our bodies and on the world around us, but it still isn’t easy to find concise facts and wisdom to help guide us. And eating sustainable seafood is one of the hottest topics, especially given its overlap with concerns about the health of our oceans in relationship to global climate change. “Sustainability” is based on a simple principle—meeting today’s needs without compromising the ability of future generations to meet their needs. In terms of seafood, this means catching or farming seafood responsibly, with consideration for the long-term health of the environment and the livelihoods of the people that depend upon the environment. The NOAA FishWatch site also helps define wild-caught fish vs. farmed fish, and includes a useful FAQ. But we wanted to get an array of opinions and advice, and what better place to stop than one of the world’s great aquariums? Some of their fishes to avoid include a few American-caught fish, which seems to counter the NOAA’s statement (“If it’s harvested in the United States, it is inherently sustainable as a result of the rigorous U.S. management process that ensures fisheries are continuously monitored, improved, and sustainable.”) Among the Monterey site’s no-nos are Halibut, Atlantic (U.S. Bottom Trawl), Grouper (U.S. Atlantic, Wild-caught), and quite a few different varieties of tuna, including bluefin, which has been extremely popular in sushi cuisine, of course. Greenpeace UK is even more specific about tuna: “If you have to eat tuna, only buy line-caught skipjack tuna.” Greenpeace is actively working on this issue in Southeast Asia, too, urging the fishing industry to use more sustainable methods in light of declining tuna stocks. Over the last few years, some restaurants have been increasing their efforts to serve more sustainable fish (including some D.C.-area eateries noted in this Washington Post article.) Now sustainable sushi restaurants (or at least restaurants prioritizing sustainability) are more than just a dream, starting with what is considered the first one, San Francisco’s Tataki [the founders of that restaurant were recognized by Time as “Heroes of the Environment“), which is now being followed by a sustainable sushi place in nearby Oakland: Torpedo Sushi. 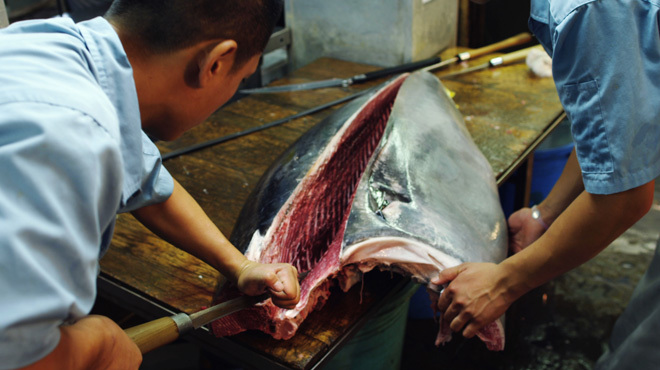 There’s also a sustainable sushi restaurant in New Haven, CT, called Miya’s, that has been around for quite awhile but more recently shifted to sustainable fish.